It was cold and rainy, so I decided to file my state license renewal this weekend. When I was in a community practice, the office manager used to take care of that (as well as credentialing, liability insurance renewals, and just about everything else). Now that I’m in informatics, I’m on my own. The administrative assistant I share with four other people barely has time to open the mail and manage our calendars, let alone handle something like licensure renewals. My state requires a certain amount of Continuing Medical Education (CME). Although I meet that requirement without issue each year just through routine activities and journal articles, it’s only half of the amount required by my specialty society. I was grateful for the reminder to catch up on my hours. Coincidentally, CMS continues to send e-mail bulletins about ICD being “closer than it seems” and one sent this week stated they had CME available. I decided to check out the ICD-10 CME. There are two modules and an article offered. The modules are targeted towards small to medium practices and large practices, respectively, and are specifically for physicians. The article is more general for all health care providers. Since I work in Big Healthcare, I made a cup of tea (Earl Grey – hot) and settled in for the large practice video. The video is narrated by Daniel Duvall, MD MBA of the Hospital and Ambulatory Policy Group at CMS. I liked that it didn’t claim that ICD-10 was going to improve care or make our lives easier. It was clear about stating that there would be “much more specificity in information sharing” and that the key point of relevance for physicians was that it is necessary for claims submission and those who delay may not be reimbursed. I’d have liked the CME better if it had been self-paced. It wouldn’t allow me to fast forward and one couldn’t forward the slides at his or her own pace. I can generally read faster than I can listen to someone read slides to me, and find that I learn more reading things on my own rather than being lectured to. There was some choppy editing that was a little annoying, so by six minutes into it I was pretty much “done” but couldn’t blast through it. Luckily it did allow me to skip to the test (which I aced – it only had three questions) and the subsequent course evaluation. I was disappointed that the evaluation wasn’t specific to this kind of educational activity. It asked me if I planned to modify treatment plans, change screening or preventive practices, incorporate different diagnostic strategies into patient evaluations, or use alternative communication methodologies with patients and families. It’s always nice to have questions that are actually relevant to the course just taken. 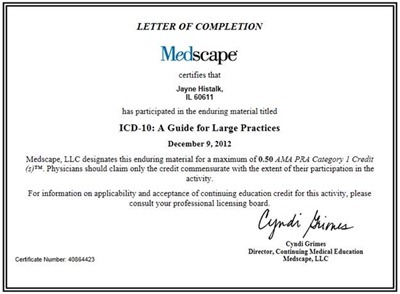 For a physician who doesn’t know much about ICD-10, the course provides a reasonably good base. For anyone who is deep into an ICD-10 playbook, it’s not worth the time unless one is killing time or needs CME hours. 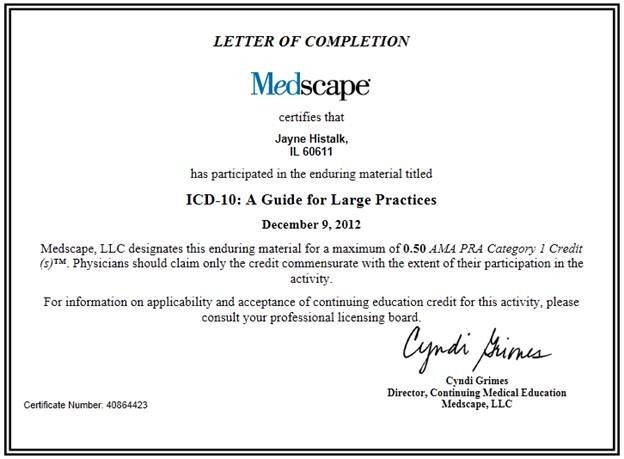 I realized when I got to the end of the course that I probably should have verified how I was logged in to Medscape. At least it will make a nice addition to the certificates on the wall of my home office.